I was recently ill for a few days and not really into our dinners. Instead I had a hunger for a pot pie; my mom always gave us Swanson's Pot Pies when we were sick - its not for every day - just sick days. 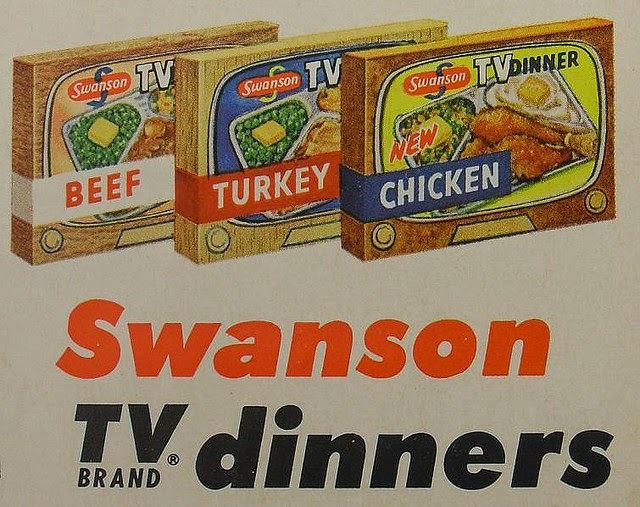 TV dinners on the other hand are good anytime! (I never claimed that this blog was a good source of nutritional information) I love how TV dinners are all divided up - each food with its own proper place - I can take them on one at a time - never messy, it is neat, clear, and I know exactly what I am eating (well, maybe). I have written and spoken on this before but it has intersected my heart once again - I like to treat life like a TV dinner - I have work, family, leisure, projects, church, worship, sports - each is in its own select spot and I live them out one at a time. Whenever they try to interact - think mix - with each other - like foods in a pot pie -I frantically try to regain order and put each back in its place. Truth - it doesn't make for a very healthy and tasty life - it leaves me hungry, a bit anemic and wondering why my days seem to be lacking some spark of life. In truth, we are to see life more like a pot pie - everything is mixed together. "When a person, yielding to God and believing the truth of God, is filled with the Spirit of God, even his faintest whisper will be worship!" We are not created to worship. Nor are we created for worship. As God's creation, an image bearer, - all I do is worship - resting, working, talking, reading, doing laundry, getting beat in basketball in the back yard by my son, washing the dog, preaching a sermon, driving across town, hugging my wife, answering an email, taking a walk, eating ..... all is worship! And it is not always neat, doesn't always feel like worship ... but it is all designed to celebrate that we live in the context of a loving, creating God who shows Himself through the most insignificant of our activities when were are not aware of His working and also in those moments when His Spirit makes Himself clearly known.